Hail Damage ? Storm Damage? Need Dent Repair? Collision Masters Has You Covered. Paintless Dent Repair (also called PDR) is the process of removing minor dents, door dings and automobile hail damage with the use of custom made tools designed to work behind the vehicles panels and allows a highly skilled Texas PDR technician to gently massage and reshape the metal back to its original condition without for repainting in most cases. Paintless Dent Repair allows your auto to preserve its original factory paint finish. In the case of automobile hail damage, paintless dent repair can save your from losing money; the insurance company doesn't compensate you for when you collect on your insurance claim from a hail storm. After a hail storm, Paintless Dent Repair is an extremely important tool in preserving the appearance and value of your car after hail damage. PDR is the preferred method of repairing those unsightly dents. With Collision Masters, repair can be done without messy overspray, poor quality paint work, or the color not matching. 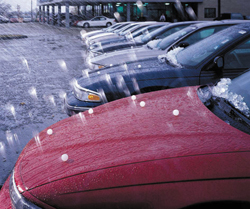 For hail storm damage, minor dents and dings, or other damage from hail, Paintless Dent Repair is an excellent alternative for use on vehicles that were produced after 1990, with small to medium size dents, with no broken or cracked paint chips that are not located near the edge of the panel. Car repair at a full service body repair shop close to you, whether you live in the , Mansfield, Plano or area. Free rental car while your car is being inspected that same day . If you need to be picked up from a particular location, Collision Masters can arrange that, too.